It’s autumn, and time for the new pinewood derby season again. We’re looking forward to a super race season, and we hope you are too. 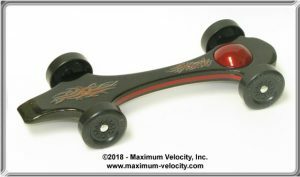 Here at Maximum Velocity we have developed some great new products to help you be successful in your upcoming races, and we have a new web site. We have a full agenda of articles and photos to educate, entertain, and (hopefully) inspire you. But we are always looking for your input. So, please send us your photos, speed tips, articles, memories, etc. We spent most of the summer working on our new web site. It is quite a change from the previous site and will take a bit of getting used to (for us as well). Unfortunately, our old site had outlived its usefulness, as it was based on old technology and could not easily be changed to meet new Internet requirements. If you have questions or issues with the new site, please let us know. Thanks. New Plan Booklet: Car Plans 10 is now available with plans for the Funny Car, the Low-Rider GT, and the Dominator design. Maxinator Kit: We are introducing a new car kit, the Maxinator, which is a very aggressively weighted, low-profile car that sports a Domed Tungsten Round. Using rail-riding alignment, this car will offer top performance. 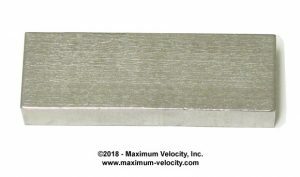 Large Tungsten Bar: We now have a Large Tungsten Bar (2.1 ounces) which is slightly heavier than twelve, 1/4 inch tungsten cubes. It is intended to be placed behind the rear axle, giving an optimum rear weight for rail-riding. We don’t have many remaining, so don’t delay. 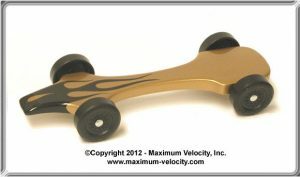 I can’t count how many times I have been asked, “What is your fastest car design?” If you have been involved in pinewood derby racing for any time at all, or if you have been a subscriber to this newsletter, then you understand that there is no car body that guarantees success. There are lots of factors that affect speed, and the car body accounts for only a few of those factors. I try to explain this, but the inquirer usually just sloughs off that answer and repeats the question. Today I would like to go through the main factors that affect speed; and since, as a subscriber to the Pinewood Derby Times you are astute and thoughtful, I know that you won’t just slough off this information! 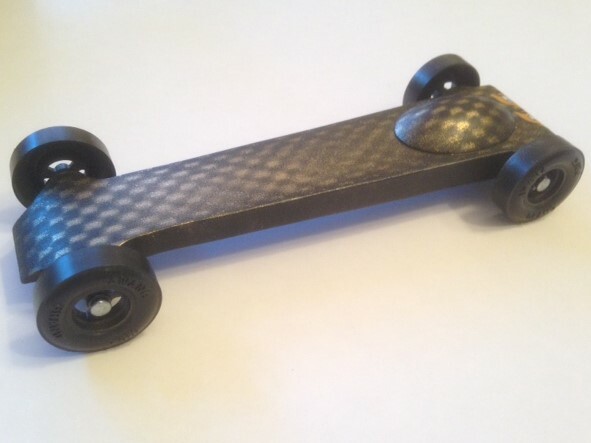 So, let’s go through the five keys that unlock the performance of a pinewood derby car. I have arranged the keys in order of importance. Lubrication is an extremely important key. The difference in time between a well-lubricated car and a car without lubrication can be several tenths of a second or more (this translates into several feet on the track). Most people use graphite for lubrication. Graphite is a form of carbon that comes in very small flakes. There are many varieties and qualities of graphite available at hobby and hardware stores, so make sure to get a good brand. Cheap brands have a lower carbon content and include impurities. 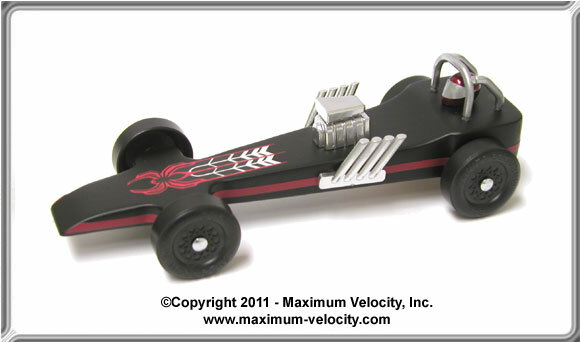 We offer Max-V-Lube brand which is a high-purity graphite, which has been proven to produce top results in pinewood derby racing. When lubricating with graphite, take the time to work it in thoroughly; a casual puff before the race is not sufficient. I recommend spending five minutes per wheel adding graphite, spinning the wheel, adding graphite, spinning the wheel etc. Since graphite works best after a break-in period, don’t re-lubricate between race heats. By the way, you will find it much easier and cleaner to lubricate before mounting the wheels and axles on the car. If you use a liquid lube (such as Krytox 100), make sure to follow the recommended application procedure. With liquid lubes, less is best. All frictional losses in a pinewood derby car come from the wheels and axles. Start by inspecting the parts in your kit to make sure they are usable. If a part has a serious flaw, replace it. Place the nail in the chuck of a drill and use a Mini-File to remove the flashing under the nail head and minimize the ridges on the shaft. Beveling the nail head slightly is also a good idea. 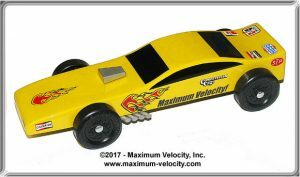 (If you are in a race using Awana or Maximum Velocity kits, the mini-file is not needed). Optionally use the Pro-Axle Press to ensure that the nails are straight and round. Finally, polish the axles with an Axle Polishing Kit until they are bright and shiny. Avoid overzealous sanding with coarser papers, as that will reduce the diameter of the axle (not desirable). Depending on the type of wheels you have, the preparation steps will change. If there are flaws on the tread surface or inside edge of the wheel, then use a Pro-Wheel Mandrel and some fine grit (wet) sandpaper to polish the wheels. On some wheels, a Pro-Hub Tool can be used to round the inside wheel hub. Finally, polishing and waxing the wheel bore also reduces friction to increase performance. In order for the car to get to the finish line as quickly as possible, it needs to go straight. If it zigzags down the track, it will travel a longer distance, but worse it will continually lose speed as it bumps and rubs against the guide rail. To minimize the amount of alignment adjustment needed, make sure that the axle slots/holes are perfectly parallel to each other and the axles are straight. Also, when using axle slots, make sure that the axles are inserted perfectly straight. The Pro-Axle Press and the Pro-Body Tool are great tools to help minimize the need to align the wheels. In addition, the Pro-Axle Guide will help you insert the wheels and axles properly. The current thought on alignment is to implement a rail-riding strategy. (1) This technique results in a car that follows the rail (straightest path to the finish line), minimizes undesirable wheel contact with the rail, and allows for more aggressive rear weighting. Normally, with rail-riding, the two rear axles are bent upwards at 2.5 degrees, the front-left axle is raised, and the front-right axle (the “dominant” or steering axle) is bent downwards at 1.5 degrees. The rear wheels are aligned to have no toe-in or toe-out, and the dominant axle is aligned so that the car drifts left about five inches over eight feet. If you don’t want to try rail-riding, then make sure your car runs as straight as possible. In an automobile, momentum helps the car keep rolling when you take your foot off the gas. 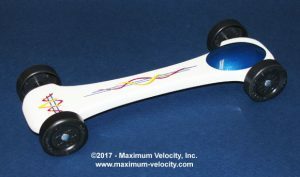 In a similar way, momentum helps a pinewood derby car to continue rolling as fast as possible on the flat section of the track. Momentum must be maximized for top performance, and the key to momentum is weight. In each race, there is a maximum allowable weight for the car (usually five ounces, but certainly check your local rules). Momentum is maximized when your car has the maximum allowable weight for your race. For a five-ounce maximum weight, you will likely need to add two or three ounces of weight to the car. But where on the car do you add the weight? Add the weight towards the rear of the car. Does the type of weight matter? The maximum weight can be achieved with any type of weight; however, the type of weight does affect how easily the desired weight and balance point can be achieved. Denser weights (such as Lead or Tungsten) take up less space, so it is easier to reach the maximum weight and to place the weight at the back of the car. Also, since denser weights require a smaller volume of space, they allow creation of more aerodynamic cars (which is Key 5). By the way, if you are in a BSA-sponsored race, ignore the picture on the front of the BSA kit. Use the slot closest to the end of the block as the rear axle. If you had asked me several years ago, “How do I make my pinewood derby car go fast?” I would not have included aerodynamics as a key. However, since that time I have read one study and performed another, both of which showed that the effect of aerodynamics on pinewood derby car performance is not trivial. Low-profile cars (smaller surface area as viewed from the front of the car) will tend to outperform higher-profile cars. Cars should taper from a smaller surface area in the front to a (possibly) larger surface area in the rear. Edges running across the car should be rounded or tapered. Wings, sails, flags, pennants, etc. add to the surface area, thus they tend to decrease performance. Fenders help air to flow smoothly around the wheels. Just make sure to use light weight wood or plastic fenders. To add some balance to this topic, Key 5 (aerodynamics) is not as important as the other four keys, so I don’t suggest that you sacrifice looks to achieve an aerodynamic shape. If your child wants to build a car that is not particularly aerodynamic, don’t worry about it. Just make sure that the other four keys are carefully followed. 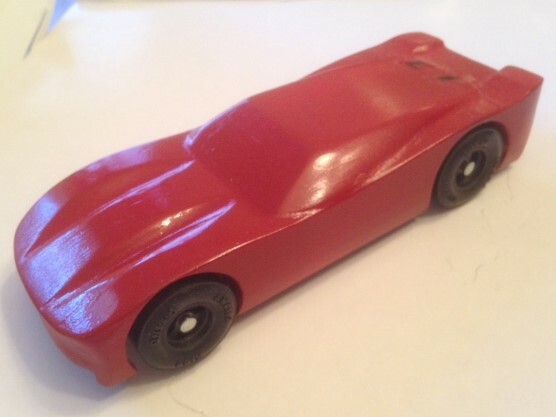 There are many other things you can do to create a competitive pinewood derby car. If you want to read further, our booklet, “Speed to the Finish” thoroughly documents the techniques and tips needed to get top speed out of your car. But whatever you do, just remember that to create a competitive pinewood derby car, make sure to use the Five Keys! (1) For a thorough discussion on rail-riding, please see: “Rail-Riding – Getting that Extra Speed” in Volume 14, Issue 4. (2) With Rail-Riding alignment, you can set the balance point closer to the rear axles. For more information, please see “Revisiting the Balance Point” in Volume 14, Issue 1. My Mother taught me how to BECOME AN ADULT…”If you don’t eat your vegetables, you’ll never grow up. Through October 16, 2018, you can get 10% off your entire order. To take advantage of this limited time offer, use coupon code OCT03NL during checkout. The “Red Bomb”, styled after a Corvette, won 1st Place. It has lightened wheels and polished axles mounted in pre-drilled axle holes. Tungsten cylinder weights were centered into the rear of the car, so the center of gravity is about 1 1/2 inches forward of the rear axle. The side aprons extend down from the base of the car about 1/4 inch and were dado cut inside about 1/8 inch for rail clearance. Red Bomb won every heat and had the fastest time of the day. The “California Gold” extended wheelbase model won 3rd Place. It has lightened wheels, polished axles, extended wheelbase with pre-drilled axle holes, tungsten canopy weight with additional tungsten disks centered behind the canopy from underneath. The paint is flat black. I then covered the car with a perforated drawer mat and sprayed gold paint over it to achieve the checkered pattern. The car ran very fast along with the front runner and the second-place finisher (one that I built but gave to one of the clubbers). I took my son to the NHRA Winternationals. 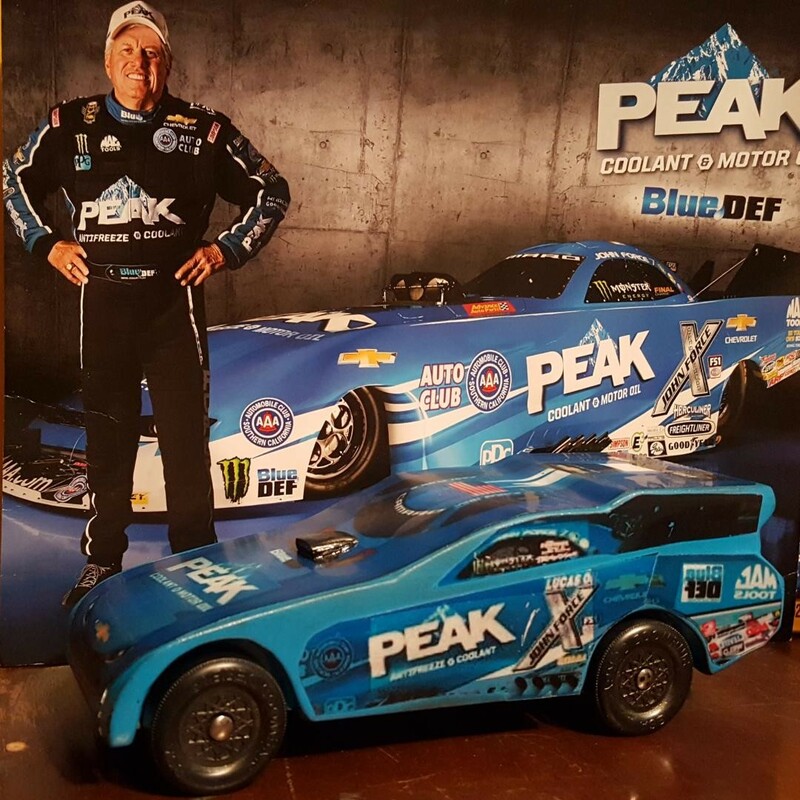 John Force is a client of the company I work for, so we were excited to make a replica of his top fuel funny car. We have a car show every year at our church, Roanoke Valley Cathedral of Praise. We wanted the show to be more of a family affair by getting the kids involved. Someone suggested we set up the pinewood derby race track and have races. For those that didn’t have cars we were going to provide our cars for rent at the price of one dollar a race. We were to put numbers on our cars and when someone rented a car they would pull a number out of a hat and that would be the car they would race for one heat. We thought we had it all worked out. I had the track and timer all set up ready to go. We decided to run a couple of cars to make sure everything worked right. When we did the timer lights would come on and go off, and the timer would only showed one lane. We worked with it for a long time and I finally called my friend who helped put the timer together and told him the problem. He asked me if we were outside and I told him yes, we had it all set up outside on the sidewalk. He told me there was too much light, and the timer wasn’t going to work correctly outside. I carried the timer inside just to see if it would work in there. Of course, it worked perfectly. I learned the hard way to race inside – besides it’s air conditioned inside! Editor’s Note – New Directions (www.newdirections.ws) offers a timer with a “sunlight option” which can be used outdoors. Q: I was wondering if you had any tips for installing Pinewood Derby axles to the car body. I drilled the holes to the recommended size (#44 bit if I remember correctly) and I own a pair of your axle pliers. But I find that the pliers have the potential to damage the outer edge of the axle head and/or the outer hub of the wheel. Obviously, this is a concern. I thought about devising a jig to hold the car from one side while I press in the axle from the other side, perhaps in a small vice. I figure the pressing force could be on the axle head, thus protecting the axle edge and wheel outer hub. Do you have any insight you could share? A: Generally, you would use a #44 bit. When you drill wood, over time the wood fibers “relax” resulting in a smaller hole. Also, sawdust and paint can get in the holes, which tightens them up. So, before installing axles, ream out the holes with the same drill bit (you can use a Pin Vise for this). That opens up the holes, cleans out any sawdust or paint, and thus allows the axles to go in easier. Another tip is to pre-install and remove a set of spare axles right after drilling the holes. Then use spare axles or round toothpicks (or a Paint Stand) when painting to keep paint out of the holes. Q: Here’s the problem … for the 2nd year in a row, we have gone to a local fitness center and tuned our cars on a treadmill just as a YouTube video explains. In both cases, the cars appeared to behave very nicely on the treadmill, tracking steadily in the correct direction as the video explains; i.e., towards the high wheel with the rear wheels holding steady against the nail head. But when we run the cars down the racetrack, we notice significant fishtailing. This has me very baffled knowing they behaved nicely on the treadmill. Of course, I am trying to figure out how to eliminate fishtailing so we don’t lose performance. I’m not sure I have much faith in the treadmill idea anymore. Do you know any alternative suggestions for tuning the wheels and axles? A: The fishtailing is either because there was not enough drift, or the rear axles were not aligned. I suggest ditching the tread mill method (which has a lot of problems that I won’t go into here), and follow the method shown in the main article. The article says you need 5 inches of drift over 8 feet. This is good for a COG of 3/4 inch. But if your COG is less than that, you will need more drift. The rule is, the more aggressive the COG, the more drift you need.